Europe is in flux. The economiccrisis, large migration flows, andterrorist attacks have put pressureon international solidarity and attitudestowards civil liberties suchas freedom of movement. To whatextent do European countries favorimmigration and receiving refugees?To what extent do they trust policymakersand one another? Are thereshared values, beliefs, and attitudesamong Europeans from differentcountries? 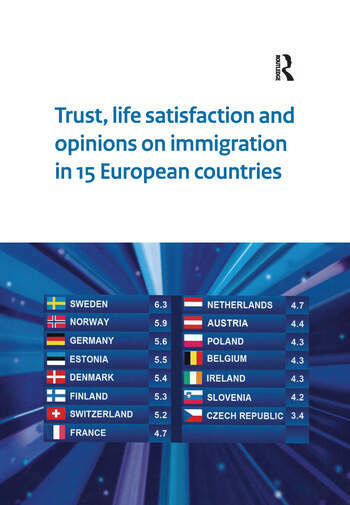 This report analyzes the most recent data from theEuropean Social Survey (ESS), a large-scale biennial study ofattitudes and values in 15 European countries, with specialattention to attitudes towards immigration. Jeroen Boelhouwer has done extensive research on the SCP Life Situation Index. Currently works at the Netherlands Institute for Social Research/SCP. Gerbert Kraaykamp is professor of empirical sociology in the Department of Sociology, Radboud University Nijmegen, and director of the Nijmegen Institute of Social and Cultural Research (NISCO). Ineke Stoop is senior survey methodologist at SCP and deputy directorâ€”Methodological of the European Social Survey.